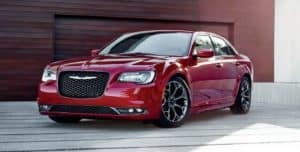 2018 Chrysler 300 Review | Orchard Chrysler Dodge Jeep Ram " "
The 2018 Chrysler 300 delivers an elegant design combined with world-class performance, efficiency and quality, all at an affordable price. 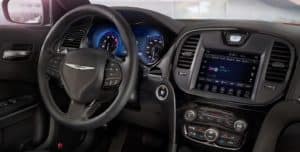 The 2018 Chrysler 300 luxury sedan also delivers class-exclusive innovations and advanced technology, including the Uconnect 4 system with Apple CarPlay and Android Auto, the segment’s most advanced all-wheel-drive (AWD) system, and the availability of a 5.7 L HEMI engine in the Chrysler 300C. Chrysler has repositioned the 300 model lineup, which now consists of the 300 Touring, 300 Touring L, 300S, and 300 Limited are all available in rear-wheel drive (RWD) or all-wheel drive (AWD). The high-performance 300C is available with rear-wheel drive only. In addition the new entry-level Touring model offers cloth interior and 17-inch aluminum wheels, while the Limited model now offers 20-inch aluminum wheels. A new Mocha leather interior option is now available on Limited and 300C models. The biggest news is that the 2018 300C model now comes standard with the 5.7-liter HEMI V-8, offering best-in-class V-8 horsepower and torque. There’s also a number of new available options that include a Sport Appearance Package and a Chrome Appearance Package on Touring trims, a BeatsAudio and Alloy Package on the 300S, a premium Harman Kardon audio system with navigation, and a power sunshade, dual-pane sunroof on the Limited, as well as a Harman Kardon premium audio system, navigation, power sunshade, dual-pane sunroof and Sun/Sound/Nav bundle on the 300C. New exterior paint colors for 2018 include Green Metallic Clear Coat and Ocean Blue Metallic Clear Coat. All Chrysler 300 models equipped with the Pentastar V6 are available with the segment’s most technologically-advanced all wheel drive (AWD) system, which includes a segment-exclusive active transfer case and front-axle-disconnect system to improve real-world fuel economy. This advanced AWD system seamlessly transitions between rear-wheel drive (RWD) and AWD with no driver interaction required to maximize fuel economy. The legendary 5.7 L HEMI engine with Fuel Saver Technology is standard on the Chrysler 300C for 2018. The V8 engine delivers 363 horsepower, 394 lb.-ft. of torque, and accelerates the 300C from 0-60 mph in less than 6 seconds. A class-exclusive TorqueFlite eight-speed automatic transmission is standard on every model, delivering best-in-class V6 highway fuel economy, plus best-in-class range. With the Chrysler 300S and 300C models the personality changes quickly when engaging Sport mode it instantly transforms the performance of these models by reducing shift times by nearly half, increases engine and throttle responsiveness, provides firmer steering feel and turns AWD “on” (if it’s off) with AWD models for improved driving dynamics. Chrysler 300S offers more athletic and youthful appointments to the lineup thanks to a unique 300-horsepower Pentastar V-6 engine with paddle shifters and sport mode, performance suspension, blacked-out exterior accents, 20-inch Hyper Black wheels, leather-wrapped sport seats, exclusive Piano Black interior accents and available signature 10-speaker BeatsAudio system. Chrysler 300 offers a 360-degree driving perspective delivered by the SafetyTec Plus Group’s Full-speed Forward Collision Warning – Plus, Adaptive Cruise Control-Plus with Full Stop, Lane Departure Warning with Lane Keep Assist, Blind-spot Monitoring, Rear Cross Path detection and more. And for drivers who want increased handling capabilities, a performance-tuned suspension with firmer spring rates, performance-tuned steering and bushings, larger sway bars (with the V8 engine) and Goodyear Eagle F1 three-season tires are available on rear-wheel-drive Chrysler 300S models. As you can imagine, there’s seriously not nearly enough space here to cover all the standard and available features across the 2018 Chrysler 300 line. The best way to learn more about the 300 lineup is to drive into Orchard Chrysler Dodge Jeep Ram, check out all the models, and take a few for a test drive to determine which Chrysler 300 full-size luxury car suits you best.